Scott Walker, the embattled first-term Republican governor of Wisconsin, will face a recall election on June 5, the Wisconsin Government Accountability Board (GAB) ruled Friday. Walker's Lieutenant Governor, Rebecca Kleefisch, will also face a recall. The board voted 5-0 in favor of a holding a recall election after finding that the recall ballots for both candidates garnered a sufficient number of valid signatures to proceed. More than 900,900 valid signatures were collected in a petition to recall Walker, and more than 800,000 valid signatures were collected in a petition to recall Kleefisch. Only 540,208 signatures were required. 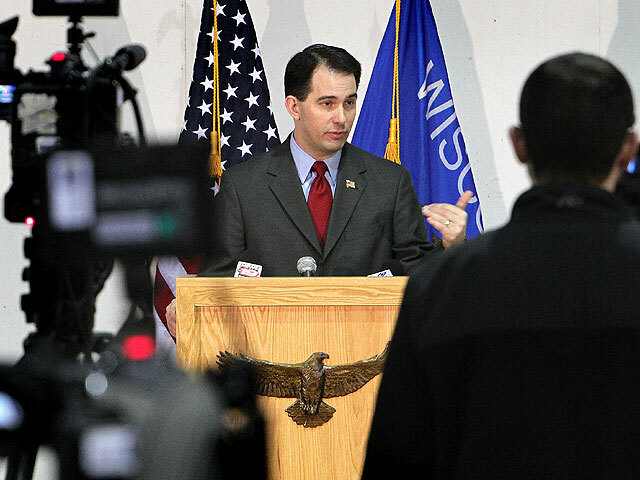 Walker became embroiled in controversy last spring after passing a controversial law that would essentially eliminate public workers' collective bargaining rights. Debate over the legislation sparked weeks of protests in the state, as well as a national conversation about the merits of collective bargaining rights for public sector workers. Democratic lawmakers in Wisconsin were so vehement in their opposition to the law that they fled the state in an effort to stall a vote on the bill, but Republican legislators ultimately used a procedural maneuver to force the legislation through, and passed it without any debate on the floor and with no Democrats present in the room. In a statement on Friday morning, the Walker campaign said it had anticipated that the recall election would move forward, and expressed confidence that voters would "stand with" the governor come June. "We have long said that we anticipated the election process would move forward," said Ciara Matthews, the campaign's communications director, in the statement. "Now it is time for voters to examine the choice they will be faced with in June." Matthews continued: "We believe a majority of Wisconsin voters will stand with Governor Walker's record of laying the foundation for a more successful Wisconsin while moving the state forward and against the Democrats' failed policies that would take Wisconsin back to the days of a $3.6 billion budget deficit. Voters are not prepared to reverse the tremendous progress the Governor has made by prematurely ending his term in this $9 million power grab by out-of-state special interests." The AFL-CIO, on the other hand, said the ruling marked a "historic" day for Wisconsin. "Today is another historic day in democracy for the state of Wisconsin," said Phil Neuenfeldt, President of the Wisconsin State AFL-CIO, in a statement. Added Stephanie Bloomingdale, Secretary-Treasurer of the Wisconsin State AFL-CIO: "Despite the out-of-state dollars that are flooding into Gov. Walker's coffers in an attempt to silence the voices of working people, Wisconsinites will be heard and will reclaim Wisconsin this June." Democratic primaries will take place on May 8. So far, there are four Democrats in the running: Former Dane County Executive Kathleen Falk, who has already secured the endorsements of a number of labor groups, elected officials, and liberal organizations, as well as Secretary of State Doug La Follette, state Sen. Kathleen Vinehout and Milwaukee Mayor Tom Barrett, who ran an unsuccessful bid against Walker in 2010.